In the vast world of Oriental and Persian rugs, a myriad of profound differences exist, whether speaking of their designs, materials or workmanship. Beyond these, one of the more distinct dissimilarities that exist is a rug’s age, which ultimately denotes it as either being an antique or modern iteration. Many renowned rug scholars consider Oriental and Persian rugs produced before the 1920’s to be antique, with everything coming after this period deemed modern. The sole reason for the designation relies on changes in the market that developed during that time, when the popularity of carpets increased so significantly in the West that mass production was the only way to meet demand. This led to changes in the way a large majority of rugs were being created, and ultimately, the quality of the pieces being brought to the U.S.
Below are some of the easiest ways to differentiate the two, and what it means to someone investing in an Oriental rug. Without having access to synthetic dyes, early rug weavers were limited to whatever was available in the plant and animal kingdom to create their rug’s palette. Commonly, the creation of these colors were passed down from generation to generation, resulting in rich, natural hues that stood the test of time, and only diminished from misuse or intense solar exposure. The one benefit of synthetic dyes, which nearly all modern carpets utilize, is their durability. Though they don’t exhibit the innate richness of a natural dye, they will often endure in high traffic or well-lit areas for longer periods. Many who collect modern carpets aren’t searching for a family heirloom or investment as much as they are looking for a complement to their home’s décor. While there are disparities in the number of knots-per-inch (KPI) in carpets of antiquity, nearly every single rug ever produced prior to the 1920’s was woven on a loom, by hand, and by a single weaver. Sometimes this resulted in small errors during its manufacture – yet, these “errors” have at times been observed as a mark of an artist’s slight imperfections, which is often sought after in high-end, handcrafted objects. Oriental and Persian rugs are almost wholly defined by the quality of their materials, whether they employ the use of silk, cotton, wool or other elements during their manufacture. For example, a pile made of extremely superior wool, which has been painstakingly twisted into beautiful threads, and then intricately woven into a design provides a luster and patina not found in those of lesser quality materials. Understandably, the biggest difference existing between antique and modern rugs is their value. 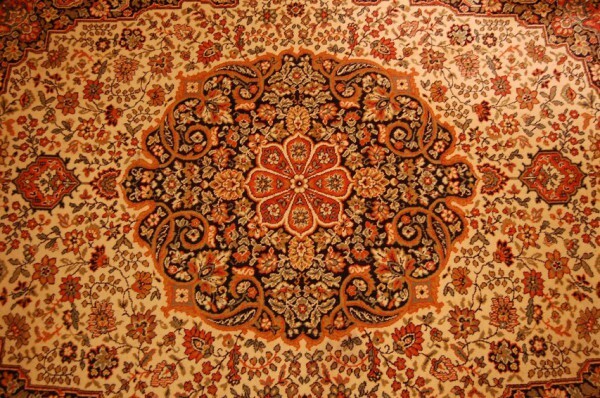 As much as quality, workmanship and preservation play a tremendous role in a carpet’s price, its period of manufacture means a lot to collectors. Overall, well-kept antique rugs are far more valuable than modern rugs, and often have an added value attached depending on who owned the carpet previously. Owning an antique rug is no guarantee it’s going to be extremely valuable, but the chances are certainly much higher. Come to our showroom or visit our online gallery to view extraordinary Persian and Oriental carpets from around the world. Ahdoot offers every service available to rug collectors and enthusiasts, including cleaning, repair and appraisal on any carpet you purchase or already own. Visit us today!